Summer is quickly coming to an end I realize that this summer has been packed full of nonstop fun with the kids! Thanks to our summer fun list and all of the fun summertime activities we were never really at a loss for something to keep us busy. 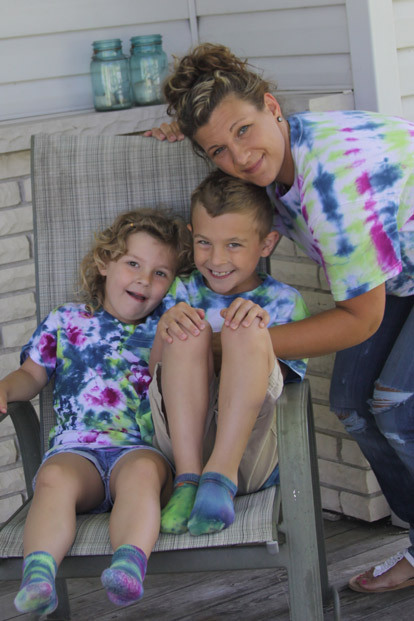 One of my favorite summertime activities to do with the kids is make tie-dye shirts. This is a little project that we have done every summer since they were very little, and it has become a super fun tradition! 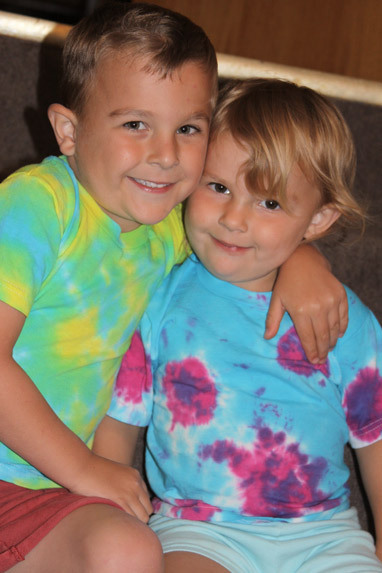 They love to create the shirts, and then they have a fun play ans sleep shirt to wear all summer long too! 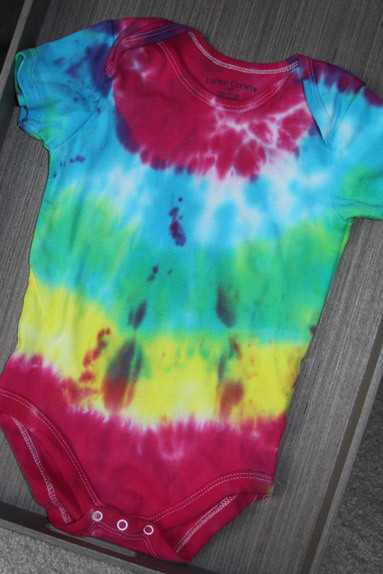 We also find it is a great way to spruce up faded white shirts, dingy onesies, and even socks that cold use some TLC. 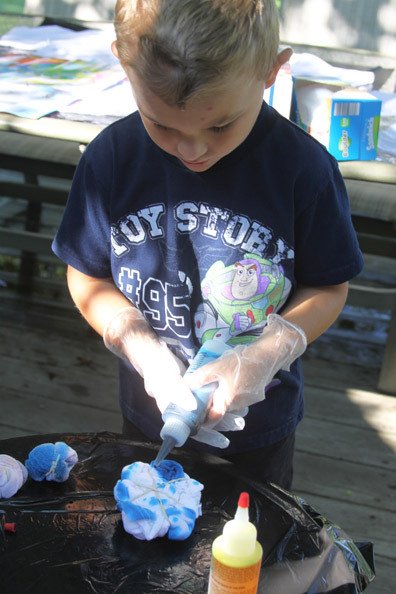 Turn drab white kids clothes into stuff that is fun to wear. This is one of those projects that I always have planned to do during the summer months. It usually is most fun to do it twords the beginning of the summer, so that the kids can wear them all summer long. I usually have the supplies on hand, and when we get a nice day where there is nothing going on, we create our t-shirts. This year I had the pleasure of making the shirts with the kids and two of their favorite little friends! We all had a great time, and it was really fun to see what designs, colors, and patterns each of the kids choose! Aren’t they the cutest little mad scientists all ready to make shirts? We used makeshift smocks to protect clothing by cutting head and arm holes in large kitchen trash bags. I find that the best way to do this is to buy a value pack of white boys undershirts and a prepackaged tie dyeing kit from a store. Then you have all of the supplies you need without having to go out and buy a bunch of little supplies. I just follow the directions in the package and we always end up with cool shirts. 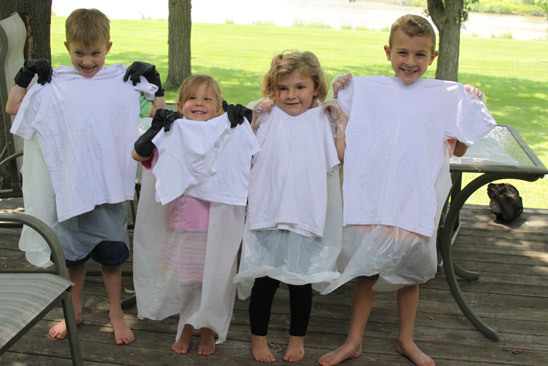 I also like to use the kids older dingy white clothing and let them dye away to see what they get. This year was ultra fun now that the kids are getting a little older! They really wanted to plan their attack and make their shirts super cool. I had each kid pick out a design from the photos in the directions that came with the dye. Then I helped each of them roll, rubber band, and prepare their shirt. They then got to add their own colors however they wanted. I even have them make one for me so I have a super cool running t-shirt for the summer! They are always proud that they made it for me, and I think it’s a fun way to get interactive with my kids. All of the kids chose to do totally different patterns and their shirts certainly showed it! They were all totally unique and fun just the kids. 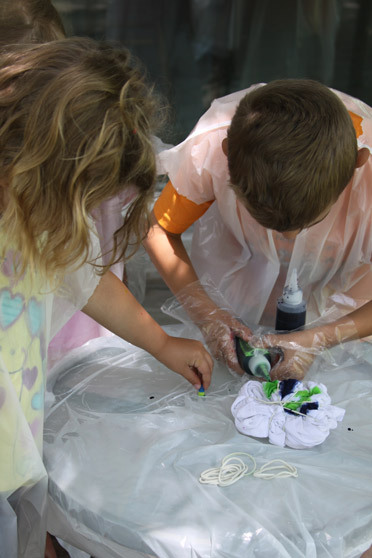 Not only is this a fun activity but it is a great way to give new life to old dingy white clothes that might be in good shape, but lack the luster of a new white shirt! It’s great for baby onesies, white socks, and big brothers white undershirts turned into a funky fun t-shirt for his little sister! 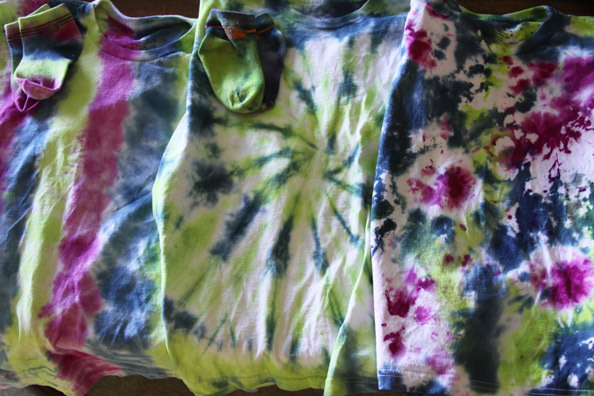 I get lots of extra use out of their whites by tie dyeing things! Why throw it away, if you can make a fun project out of it! This is a couple years back on tie dyeing day – at this age the socks were their favorite! And my…. I can’t believe how my kiddos have grown! The pictures so remind me that the small amount of effort that goes into putting together these projects for them is so worth it, and that when the look back they will remember that we did lots of fun creative things, made lots of memories, and spent lots of time together! 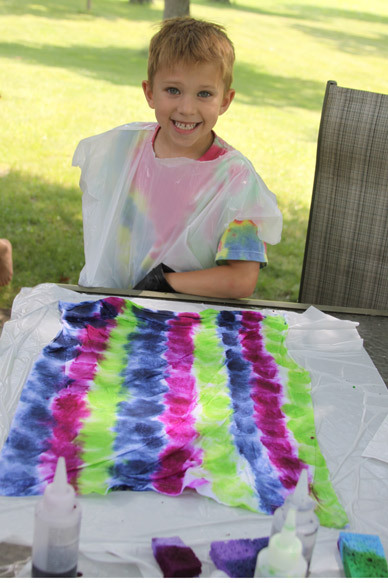 No matter what age your kids are – they will love to make and wear their own tie dye shirts! Make it a summertime family tradition, that they will never forget, and that you will always look forward to!